Your organization is unique, so why should you force your awards process into someone else's mould? 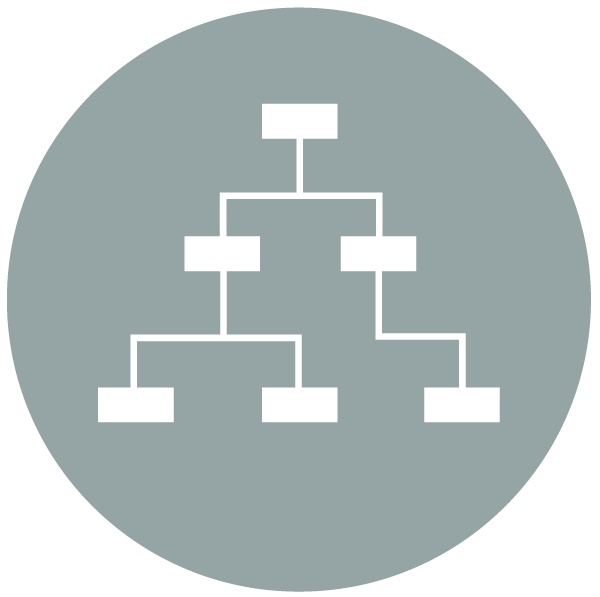 With multiple levels of categorization, you can structure your awards to suit your members and your workflow. 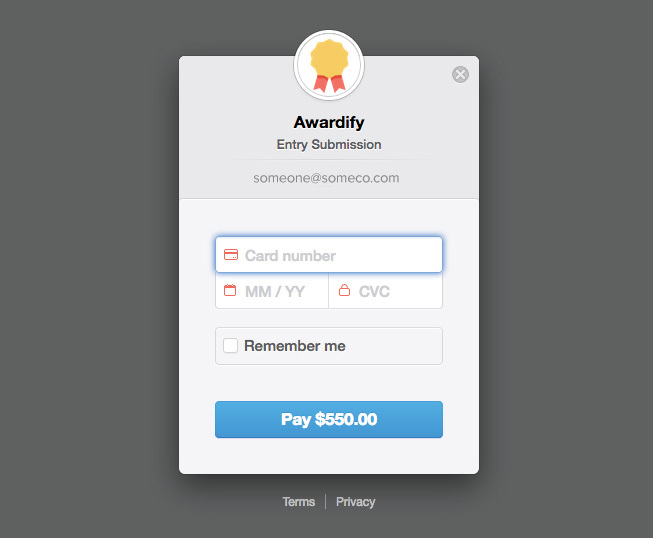 Create custom entry forms and judging criteria for each category in minutes. Collect exactly the information you need with field types such as rich text, radio and checkboxes, embedded media, and uploaders for mp3, images, documents, videos, and more. Configuring criteria is easy. Create as many or few criteria as each category needs simply by setting a criterion's title, description, and percentage weighting. Judges view the full contents of an entry online, with evaluation tools alongside the entry. 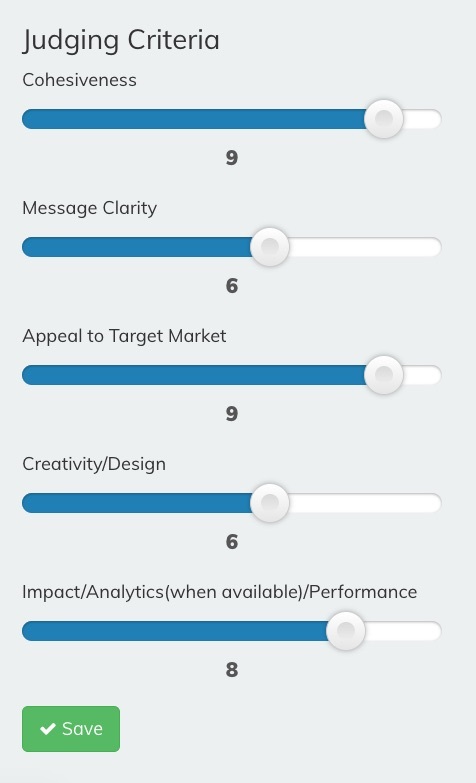 Scores are set for each criterion on a simple scale with user-friendly, touch-screen enabled controls. Awardify takes care of the calculations to ensure that the 1-10 score results in the correct percentage toward the entry's total score. With a comprehensive admin panel, user-friendly members area for entry submission and judging, and a fully-fledge public website customized to your brand, you are in command of how you promote the good work of your members. 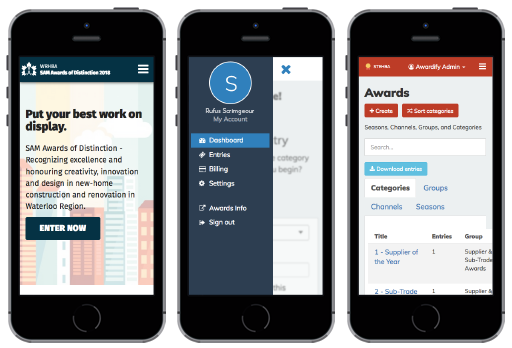 All aspects of Awardify are designed mobile-first, from the admin panel to the members area and the public website. Complete all your administration, submission, and judging from any device. Accept payment online (for submission fees and for awards gala tickets) by credit card, or give people the choice to pay manually by invoice. Set submission fees for the whole season, or fine-tune category by category. Payments are processed by Stripe, a leader in online security. Add on public voting to let the people have their say. 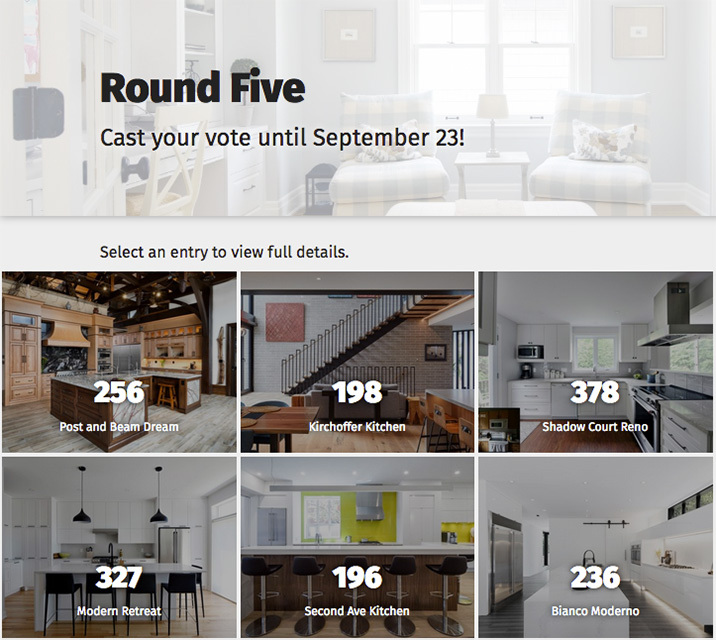 Finalists assigned to voting rounds appear on a special website designed to make voting simple and engaging. 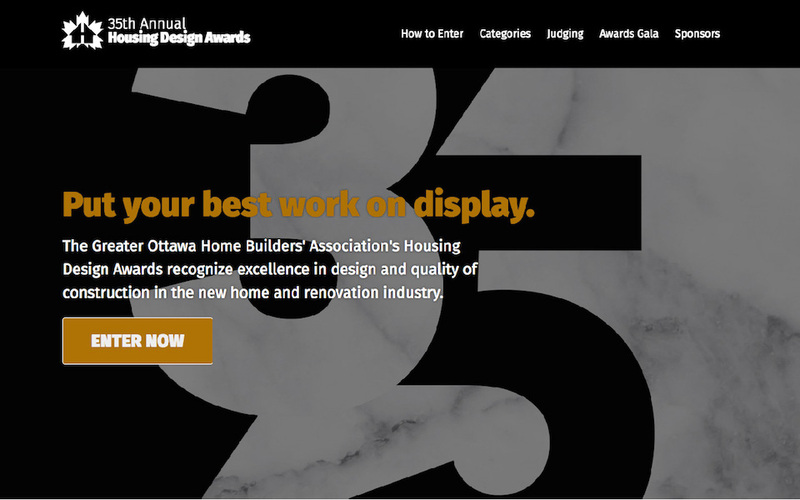 The voting website is customized to your brand, and can run on a custom domain to put you in control of how you present your finalists to the public. Sponsors are saved as a library to reduce your setup work each year. 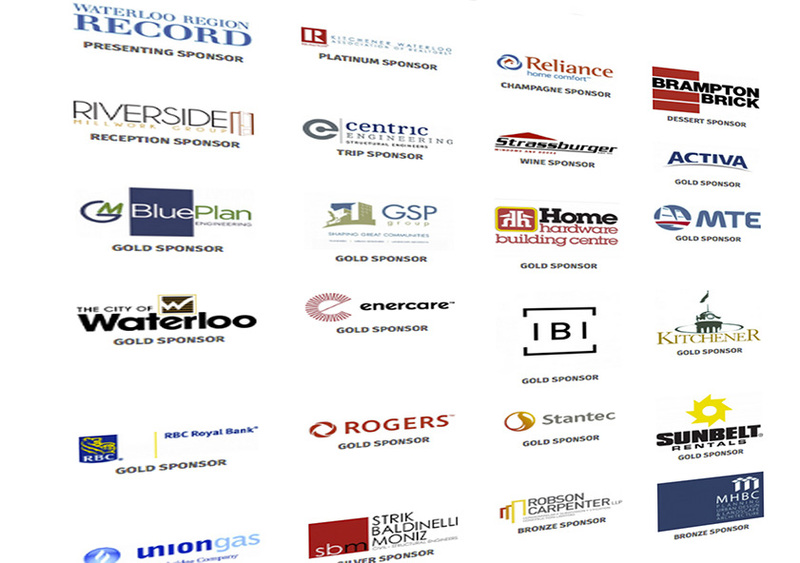 You can add sponsors to an awards season, or assign them to particular categories. Your sponsors are displayed boldly on the public website, in a simple grid or sized by rank, to showcase the people who support you. And with a customizable sponsorship signup form, you can grow your network with ease. 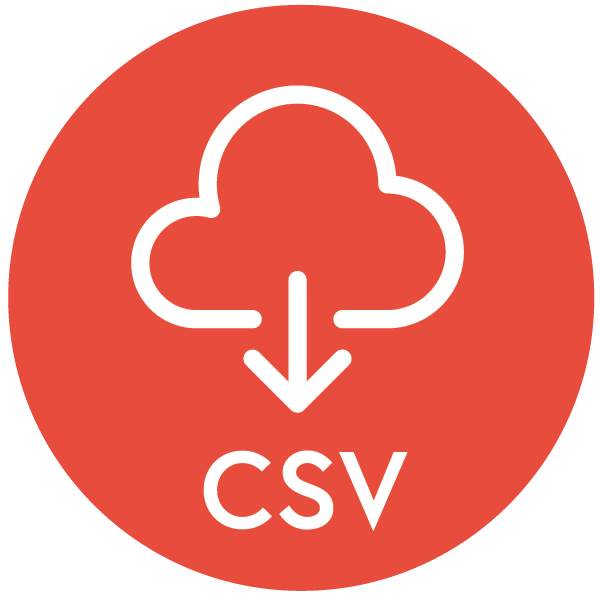 Entries and public voting export to CSV, allowing you to work with your data in Excel, or import into another database or app. We know running an awards season is a mammoth task! Take the headache out of it by working one-on-one with a dedicated developer to make sure your awards go off without a hitch. Connect with us by text, phone, email, or video chat. We're committed to making Awardify friendly to humans. Add the following to your subscription at any time. Which days work best to reach you? If you're a human, don't fill this in.